World Record Lake Trout -- 72 lbs. 0 oz. Fresh water lakes (example, Lake Watauga, Tennessee ) of the northern United States are where the "Lakers" call home. 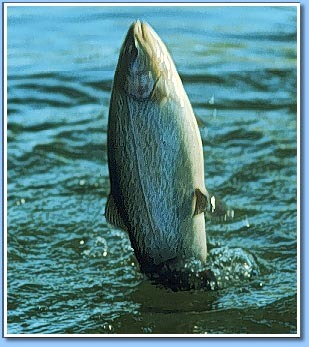 Actually a char more than a trout, they are closely related to the Dolly Varden. 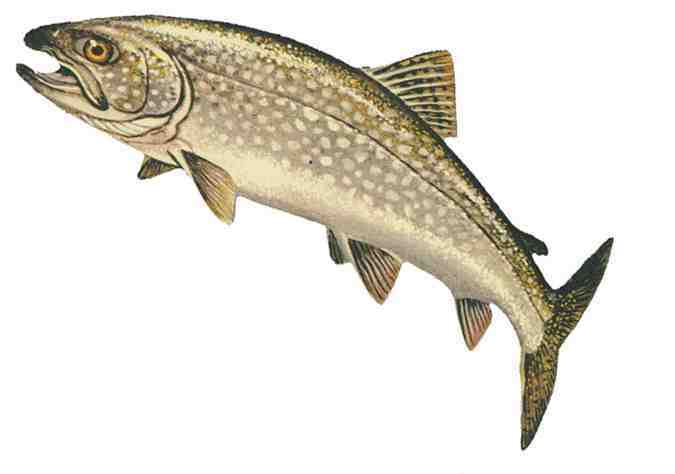 The lake trout is also known as the Mackinaw, lake char, touladi or gray trout. Our friends to the north, of course, have their own moniker for this fish, including paperbellies and leans. This is especially the case for those fish that call Lake Superior home. TIP: Catching them is a blast – especially if you use a fly rod. Make sure to match your rod to your intended target and use the correct fly pattern. Check with the local marina for specifics about the lake, too. Lakers spawn in the fall with the eggs hatching in the spring. Unlike other trout species, the female does not build redds (nests) for them. The eggs are laid on the bare, rocky bottom and along rock ledges. These cold water babies time their young's "birth" for that time when the water is a bit warmer. It really is a feat of exquisite timing. Maturity is reached between 4 and 10 years of age, sometimes as late as 17 years! Yeah! They mature and grow verrrrrrrryy slooooooowwwlllly. The entire life cycle is spent in fresh water anywhere from 60 to 300 feet deep. Lake trout live out their life in the lake they are born in until they end up as fodder for other aquatic animals or in your skillet! “Lakers” may grow slowly, but they do grow BIG! Between 15 and 50 pounds is the average with a world record at 72 pounds. Imagine hooking up with that sucker! What a fight! 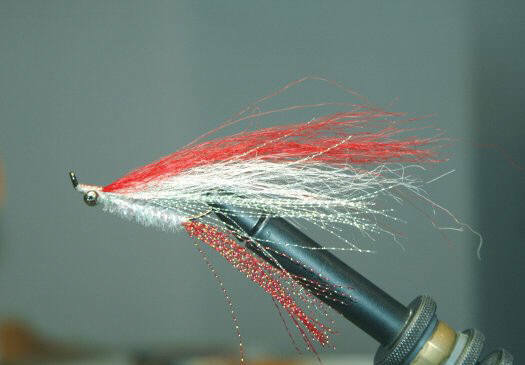 The Gray trout will eat just about anything that won't eat it first. They are carnivorous and the young ones eat a variety of small invertebrates. Then as adults they will prey upon the unfortunate alewives, chubs and sculpin that happen to cross their path. As adults, they will attack larger spineless creatures. Being what is called "opportunistic", they feed whenever the "opportunity" arises. Mackinaw are a typical trout and can be served up in many different ways. Smoking, grilling, broiling and the old standard breaded and fried all work well with touladi. If you are a little more adventurous, use your favorite cooking sherry or wine for added flavor and just enough BAM! to make it interesting. Here's something you could attempt (if you are brave enough). Smoke your laker and let it cool. Flake the meat and discard the skin. Now either mix it up like you would tuna OR spread the flakes over a salad. The effect is tremendous and extremely unique. 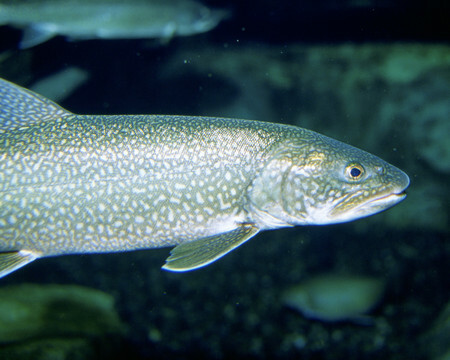 The lake trout is sometimes mistaken for the brook trout. The difference is the tail. 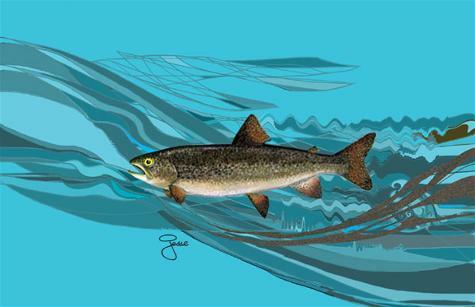 Lake trout have a heavily forked-shaped tail where the brook trout has a flat tail. Then there is the size difference (listen up guys!) separating the two species. You will rarely see a brook trout over two pounds where lake trout average above 15 pounds on a regular basis. Most of the time, the Lake Char will be silver in color with cream colored spots that you might need your reading glasses to see.